A fantastic newly refurnished two double bedroom house only a short distance from St Katherine Docks and Tower Hill Station. The property offers a large semi open plan reception room with newly fitted kitchen and dining area with direct access to a paved garden, two double bedrooms and an elegant bathroom suite. 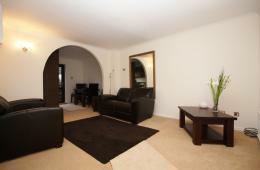 The house is situated within a quiet residential development and also benefits from off-street parking. 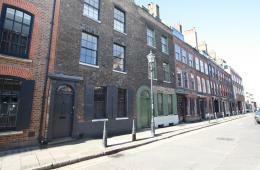 A charismatic, authentic Georgian townhouse situated on Wilkes Street - one of the most desirable roads in Spitalfields. This 2,734 sqft home oozes character and has been impeccably restored to its original charm by the current owners. The property is set over five floors with a utility and reception room plus two further reception rooms on the first two floors and three bedrooms plus a huge bathroom on the next two levels. There is a further bedroom and bathroom on the lower ground floor with a vault currently being used as a wine cellar. The orangery to the rear of the property; which on its own is around 350 sq ft, has been converted to an exceptional kitchen and dining area with a beautiful vaulted glass ceiling and access to two paved courtyards making it the perfect entertaining space. This elegant home is close to the most popular bars and restaurants in the heart of London's artistic East End, with Liverpool Street Station only a five minute walk away.